In December 2017 the AZTARNA label launched the new ALBOKA album at the 52nd Durango Book and Record Fair. This veteran folk group, led by Alan Griffin and Joxan Goikoetxea, update their catalogue with Lurra, ur, haize, their fifth release in almost 25 years. The new CD, offering a generous 17 tracks, is in the trademark Alboka style. As connoisseurs might expect, many are lesser-known traditional songs and dances, but there is also material in a newer style and character, in original and sometimes surprising arrangements. Coming 13 years after their last album Lau anaiak, Lurra, ur, haize differs from earlier Alboka releases in its greater emphasis on present-day issues, for which well-known specialist lyricists like Xabi Paya, Amets Arazallus and Harkaitz Cano have been invited to participate. 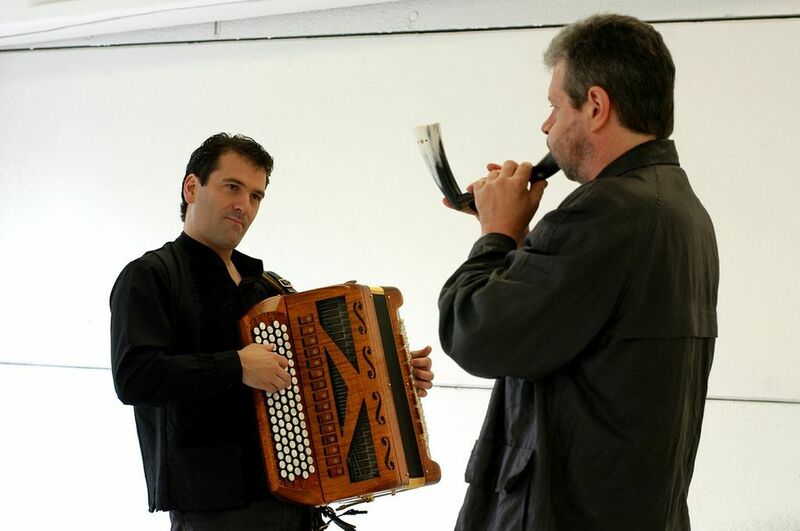 The very fine instrumentalists Fiachra Mac Gabhann and Peter Maund, who have taken part in almost all Alboka albums, are again present here, and the CD includes a popular single, 'Mundua ala gu', performed by an unusual combination of singers: Alex Sardui (Gatibu), Petti, Eñaut Elorrieta (Ken Zazpi), Mikel Urdangarin and Amets Arzallus. Supplemenary recordings at GARATE Studio (Andoain, Gipuzkoa) by Mikel F. Krutzaga. The veteran group ALBOKA, one of the best-known and most representative in Basque traditional music, specialise in presenting old music, both sung and instrumental, in a new guise, as well as composing new material in a convincingly traditional style. They have twice been nominated for the Music Prizes awarded by the SGAE-AIE, the Academy of the Art and Science of Music, and one of their albums has been chosen as one of the best European records of the year by the German magazine FolkWorld. Apart from band leaders Joxan Goikoetxea and Alan Griffin, over its 25-year history the band has had at various times the following members: Txomin Artola, Josean Martin Zarko, Juan Arriola, Juanjo Otxandorena and Xabi San Sebastian, and have played at many European folk festivals like Celtic Connections (Glasgow, 2002 & 2003), WOMAD Festival (Athens, 2002), Modern Folk Music Festival (Cairo, 2002), Musica delle radici (Nogara, Italy, 2000), Strictly Mundial (Zaragoza, 2000), Euromusica (Székesfehérvár (Hungary, 1996), Festival de Mùsicas Vivas (Vic, Catalonia, 1998 & 2000), Dranouter Folk Festival (Flanders, 1995), Folk Segovia (1995), Folk Getxo (Basque Country, 1998), Festivales de Navarra (Navarre, 1996), Euskalherria al C.A.T (Barcelona, 1997), Círculo Bellas Artes (Madrid, 1997), Folkest (Spilimbergo, Italy, 1997 & 2006), Festival Música Interceltica (Italy, 1997), Førde Music Festival (Norway,1998), Festival Ottocento (Saludecio, Italy, 1998), Manifesta 98 (Amarante, Portugal, 1998), Conciertos de Radio 3 (Spanish National Radio, TVE 2, 1998), Transhumances Musicales (Laàs, France, 1999), Pir 99 (Huesca, Spain, 1999), Musiche Presenti (Reggio Emilia, Italy, 1999), Concerti Scaligeri (Verona, 1999), Festival de la Luna Celta (Toledo, Spain, 1999), International World Music (Getafe, Spain, 1999), Musicas del mon (Catalonia, 1999), Folk y Raices (Tenerife, 2000), Udazkenean Folk (Donostia-San Sebastian, 2001), and Folklorum (Görlitz, Germany, 2007), William Kennedy Piping Festival (Armagh, Ireland, 2009). ALBOKA came into being in 1994 when three established Basque musicians, Txomin Artola, Josean Martin Zarko (Ganbara, Xarnege) and Joxan Goikoetxea, and Irishman Alan Griffin decided to set up a group to play instrumental Basque music. 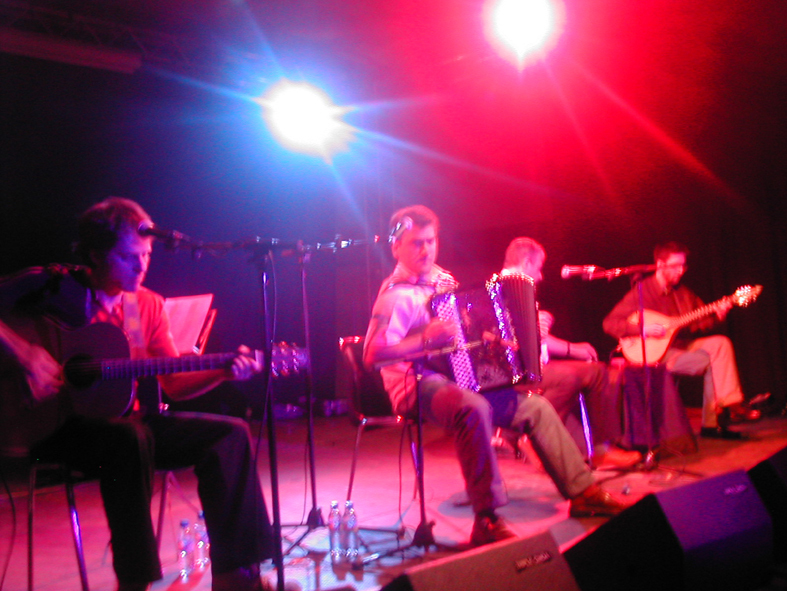 The acoustic instruments - guitars, mandolin, bouzouki, ttunttun, accordion, alboka, bagpipes, flutes and crumhorns - and a carefully chosen selection of dances and airs taken from the living tradition and from the great Basque music collectors, culminated in the group's eponymous first album Alboka, which marked a departure in a Basque folk music scene more accustomed to vocal recordings. In 1997 they were joined by fiddler Juan Arriola, and began to widen their repertoire to include songs and also newly composed tunes in the traditional style. These developments are reflected in their second CD, BI BESO LUR, which also features prestigious guest musicians (Arantza Irazusta, Xabi San Sebastian, Peter Maund, Ixiar Oreja, Juan Mari Beltran, Urbil Artola, Luis Camino and Olatz Zugasti), and confirms their distinct acoustic style in the treatment of instrumental Basque music. In 2001 ALBOKA augmented their core members for their third CD LORIUS, produced by Suso Saíz, an album bristling with new ideas, full of delights and surprises, with its carefully chosen combination of traditional material and original compositions. This CD boasts contributions from a number of star performers, not least of whom is Hungarian singer Márta Sebestyén, singing in Basque on five of the nineteen tracks which make up the album, and who also performed with ALBOKA in their dynamic live act. Márta's fame has spread even further through her performance on the Oscar-winning soundtrack of The English Patient and on Costa-Gavras's The Music Box. In addition to singers Xabi San Sebastian and Eliseo Parra, there were contributions from Fiachra Mac Gabhann, Juanjo Otxandorena, Peter Maund, Juan Mari Beltran, Iñigo Monreal, Garbiñe Sagastibeltza, Christophe Juste, Tino di Geraldo, Julio Andrade and David Escudero. Their most recent release until the present album was LAU ANAIAK, which came out in 2004. It was a nominee for the Music Prizes awarded by the Spanish SGAE-AIE, the Academy of the Art and Science of Music and was chosen as one of the best European records of the year by the German magazine FolkWorld. Amongst the guests on this album were the usual back-up musicians Fiachra Mac Gabhann and Peter Maund, joined this time by Israeli percussionist Zohar Fresco and Basque singer Benito Lertxundi (´Hariztarren balada').